The weather outside is frightening, you’re freezing even under all those layers of clothes, and the birds? They’re doing fine, dallying from branch to branch, appearing brave and prepared. 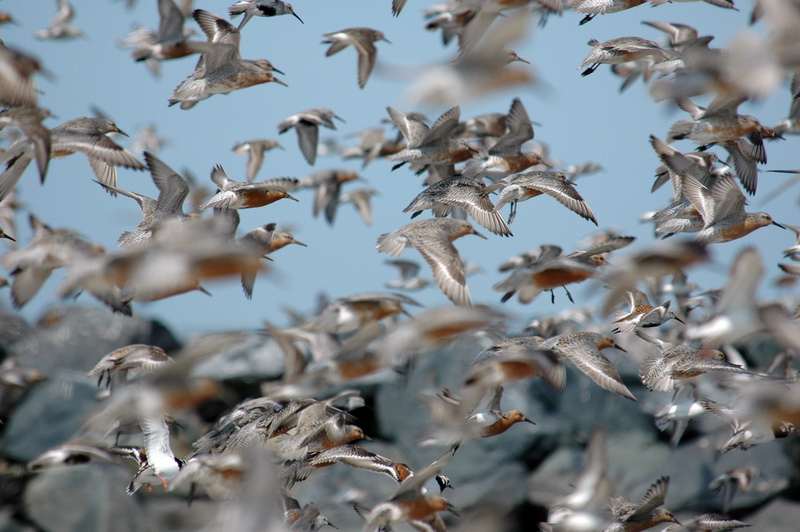 Though most birds migrate, some are year-round, staying for the arduous months. We wonder, how do birds stay warm in the winter? Like us, birds employ a variety of survival tactics, from using their downy feathers as protection to staying huddled in groups, and increasing food intake. Discover the many ways birds keep warm and cozy this winter. Birds keep warm in several ways during cold weather. One way is by eating high-energy foods, especially foods with high fat content, which works as an insulator and an energy reserve. Birds eat during the day and build up fat reserves. Typically, a bird can put on up to 15 – 20 percent of its body weight in extra fat before it has trouble flying. Birds are careful not to overeat, though, since this will make them vulnerable when trying to out-fly predators. Once content with food, birds use their metabolism to generate heat. Birds have white fat (humans have brown fat), which becomes a high-energy fuel used to generate the warming process, called thermogenisous. This simply means shivering. Shivering adds heat from muscle movement. All birds shiver through the cold to keep their core temp from about 106°F to 109°F. Unlike the surrounding temperature, a bird’s interior is basking in the sun. Feathers come in handy, since even a thin layer will shield birds from the outside air temperature, which could mean a difference of over 100 degrees! Feathers keep cold air away from their bodies and also trap body heat; in addition birds can tuck in a leg or two under their down feathers. It’s wise for birds to stay out of windy areas, and hide inside nooks, crannies, or woodpecker cavities. Nestling inside a tree or sitting under the sun beats staying in the bare cold. Some birds, such as chickadees, nuthatches, some woodpeckers, jays, and crows will store away (cache) food during warmer months to eat throughout the winter. When it’s cold outside, birds must abstain from energetic activities like singing or building nests to conserve energy. Birds also huddle together to conserve warmth — how cute! This helps to make them look not so vulnerable when a predator is around. While winter halts their reproduction, some birds use this strategy to counter death when their numbers are low. It may appear that all birds are surviving winter, but sadly, not all will make it. Some birds don’t have the adaptation to withstand cold temperatures. In that case, migration is the best option, but it also means less time feeding, more time flying, and a higher chance of encountering danger, so our bird friends may be staying after all. They could use some help staying warm. When birds shiver they raise their metabolic rate, which keeps them warm but uses their fat reserves. You can set up a bird feeder and fill it with high quality seeds to replenish their energy. Also consider leaving out some fresh, unfrozen water, and adding a warm shelter like evergreens or a roost box to your backyard.